10th Period blogger Stephen Dyer did a little digging into ECOT once again bragging about the size of their graduating class. He not only reiterates the fact that that dropout rate is the worst in the country, but also found that their career tech numbers are a tad bizarre. 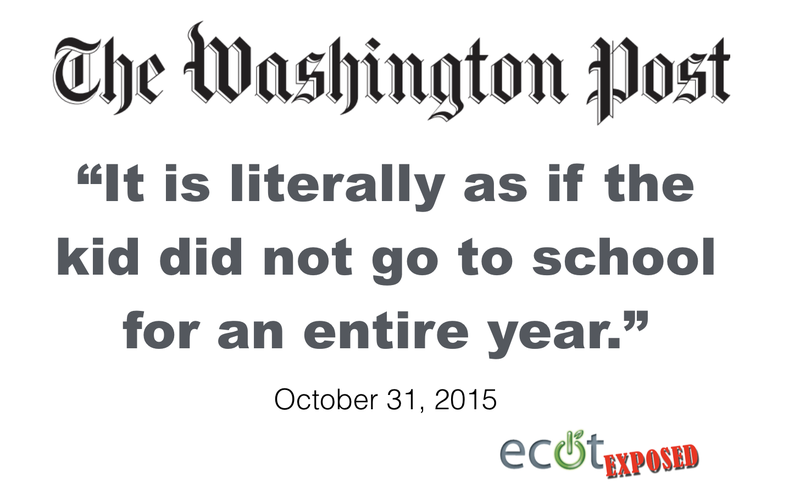 it’s important to see just what this “real world learning experiences” ECOT declares actually are. Looking through ECOT’s state funding report, you can see which categories their students are being funded by the state to take. ECOT has 2 kids taking Category 1 courses — what most of us think of Career Tech training (plumbing, carpentry, welding, etc.). ECOT has 6 kids taking Category 3 courses. And they have 303 students taking Category 5 — what I grew up knowing as Home Economics. I’m not knocking Family and Consumer Sciences, which is a legitimate endeavor, complete with a national association. But let’s stop pretending that ECOT is teaching kids how to bead a weld or plumb a house or make sure support beams are appropriately plumb. Oh, and thanks to new changes in state funding laws, they’re getting $380,847 to do it. Elizabeth Stillgess, the parent of a former ECOT student, testified before the Ohio Senate Finance Committee on May 2, 2016. She knows firsthand why so many students leave ECOT. AN UNBELIEVABLE STATISTIC! ECOT, which likes to brag about how many students they enroll, don’t like to talk about quality. In this post, blogger Stephen Dyer, points out that ECOT failed more students than all other Ohio school districts COMBINED. No wonder ECOT (and Ohio) is the laughing stock of the charter school movement. While ECOT may account for 5% of Ohio’s high school graduates, it accounts for more students who don’t graduate than (drumroll please) all Ohio school districts combined! If ECOT were the 610th Ohio school district (under Ohio law, charters are treated as districts), it would account for more than 1/2 of all non-graduating seniors in this state. There were 2,918 ECOT kids who didn’t graduate in four years, according to the latest state report card, and 1,852 who did. Statewide, school districts failed to graduate 2,626 and graduated 27,748. 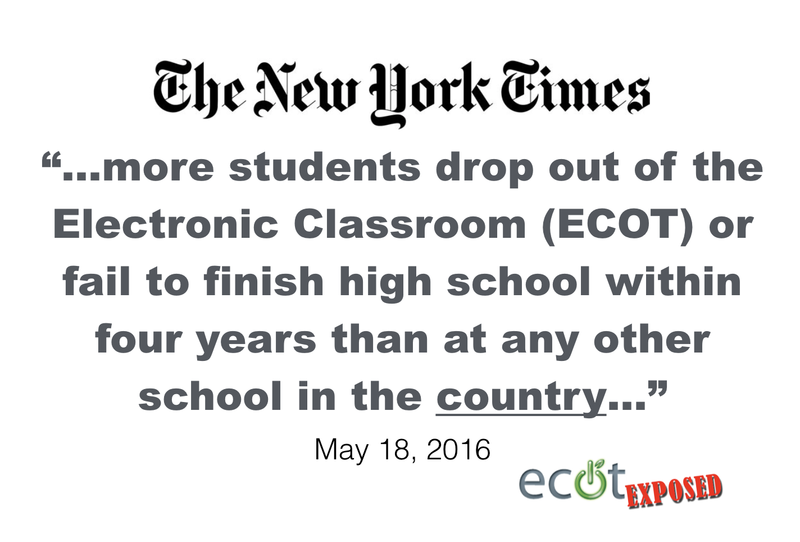 This is just more evidence that ECOT is, in fact, America’s Dropout Factory. The New York Times highlights ECOT, in a scathing article, about their graduation rate being the lowest in the United States, which include Ohio cities like Cleveland and Youngtown. ECOT’s very rich owner, William Lager, declined to comment for the article. More students drop out of the Electronic Classroom or fail to finish high school within four years than at any other school in the country, according to federal data. Even as the national on-time graduation rate has hit a record high of 82 percent, publicly funded online schools like the Electronic Classroom have become the new dropout factories. When students enroll in the Electronic Classroom or in other online charters, a proportion of the state money allotted for each pupil is redirected from traditional school districts to the cyberschools. At the Electronic Classroom, which Mr. Lager founded in 2000, the money has been used to help enrich for-profit companies that he leads. Those companies provide school services, including instructional materials and public relations. For example, in the 2014 fiscal year, the last year for which federal tax filings were available, the school paid the companies associated with Mr. Lager nearly $23 million, or about one-fifth of the nearly $115 million in government funds it took in. Critics say the companies associated with Mr. Lager have not delivered much value. “I don’t begrudge people making money if they really can build a better mousetrap,” said Stephen Dyer, a former Ohio state legislator and the education policy fellow at Innovation Ohio, a Columbus think tank that is sharply critical of online charter schools. The article discusses ECOT’s failures as a school and also shines light on the owner’s vast profits and political donations. …it’s astonishing that ECOT continues to escape the scrutiny of lawmakers despite meeting only three of the 24 possible state testing and graduation standards, receiving F grades in all but one category. And growth came for ECOT despite its consistently low state report-card results: It ranks among the worst-performing schools in the state. ECOT also spent another almost $11 million on communications last year. ECOT spokesman Ryan Crawford said he couldn’t immediately say why the communications budget was so large but said it might include advertising. And ECOT’s founder, Lager, has spent at least $1.13 million on Ohio campaigns in the past five years alone. Lager could not be reached for comment, and his spokesman said he couldn’t reach him, either. ECOT Exposed Create a free website or blog at WordPress.com.